Often times, there is inadequate water drainage around your home that could be remedied through the installation of culverts or proper downspouts used as water diversion systems. 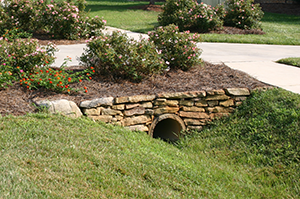 Properly installed culverts and drainage systems, may help to improve the performance of your lawn and shrubbery as well as preventing basement leaks and cracks in your driveway. 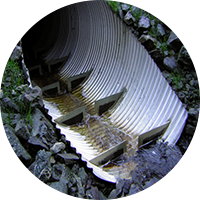 A culvert is typically built underground to prevent inconveniently located streams and rain runoff from flooding roads, highways, streets, and railroads. Culvert can also be used as a verb: if water pools in your driveway and then seeps into the foundation of your house, soaking the brand-new carpet in the basement that you thought you’d just waterproofed, you might wonder why the builders didn’t culvert that underground stream! Downspouts are often times overlooked as a significant cause of heavy water problems (in), and around your home. 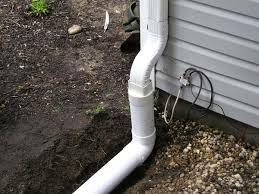 In our area, downspouts should be run underground and away from any structure, as to divert surface water. The roof of your home sheds a substantial amount of rainwater, which subsequently enters your home’s gutters and exits via the downspouts (you should also have an adequate number of downspouts around your home). Once water is diverted at ground level, it is very important to carry this large amount of water away from the structure. Properly installed culverts and drainage systems will ensure your foundation and footings, do not become overly saturated. 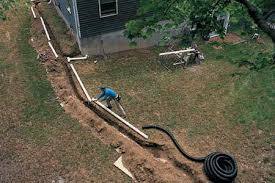 We have the equipment and know-how, to install downspouts and culverts, quickly and properly!